← The Never Ending Dilemmas of Jon Jones and the UFC PR Machine. I had a similar experience in the 90s when I first heard TDS. It completely changed my concept of what music could be. When I hit play for the first time, what came out of my speakers sounded like ugly noise. By the time the album finished playing, something in my head had clicked. I called my friend (on the landline, of course, nobody but CEOs had mobile phones back then) and told him that I just heard the album Marilyn Manson wished he could make (Manson was big back then, and still Reznor’s protege). A year or two later I rode my bike to the record store, got inside just as they were opening the doors, and asked for a copy of The Fragile. The guy behind the counter had to cut open a cardboard box because they’d only just got the shipment in. The Fragile is still my all time favourite album. Interestingly, With Teeth is the only NIN album that I don’t really like. I’d waited six years for it, and what I finally got to listen to sounded bland and underproduced. It felt like With Teeth was an album that…well, not anyone, but a bunch of people could have made. 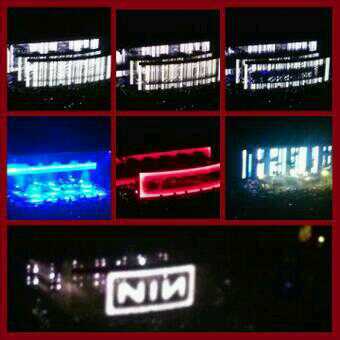 I sighed, and resigned myself to the idea that NIN was now the sort of has-been band that keeps putting out albums, but never recaptures what made them great way back when. But then came Year Zero, which was phenomenal. And The Slip, and Hesitation Marks, and all my fears evaporated. All great albums that sit comfortably alongside NIN’s output from the 90s. But that leaves With Teeth as this odd blip of mediocrity on an otherwise spectacular discography.